An orphaned juvenile river otter (17-262) arrived at CROW from Fort Lauderdale on February 7, 2017. The otter was abandoned by its mother and a reintroduction effort was unsuccessful. It will remain at CROW for a few months until it is old enough to be released. Here is a video from WINK-TV of the otter arriving at CROW . The young otter has been enjoying life in the outdoor enclosure. She is learning to hunt live prey items and swimming in all parts of the pool. 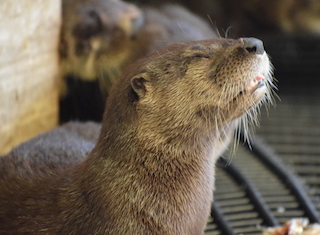 Four other otters have now been moved into the otter enclosure. The otters are learning new skills from each other and enjoying being social with each other. 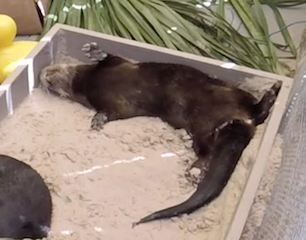 Watch the otters on the live webcam at crowclinic.org! 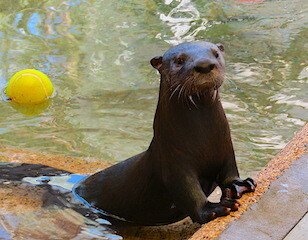 The group of otters continue to receive new enrichment daily to improve their hunting skills. Enrichment items include toys, natural foliage, and live prey such as shrimp. 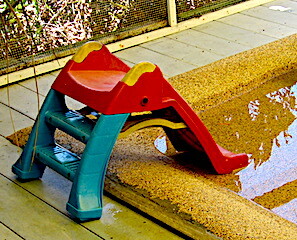 The otters have received a child's slide in their enclosure as an enrichment tool. This mimics the banks of the rivers and ponds where otters live. Watch them on the live camera to see them use it! The group of otters got a "cool" surprise. 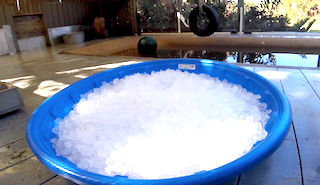 A baby pool filled with ice cubes to help them cool off and have some fun. Visit our Facebook page for a video of their good time! 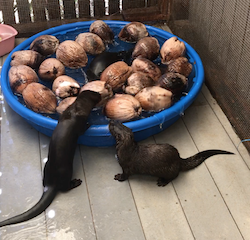 The group of otters spent some time earlier this week playing in a pool of floating coconuts. This is one of the many forms of enrichment used to stimulate the otters development into adults. The six otters in our care were spoiled yesterday with a variety of different natural enrichment items including palm fronds, coconuts and a sand box! All of these are things they will encounter in the wild once they are old enough to be released. You can view a video of their play by visiting our YouTube channel. All six North American river otters were given vaccinations for distemper today. They receive a full series of vaccines while at the clinic including a vaccine for rabies as they are a rabies vector species. 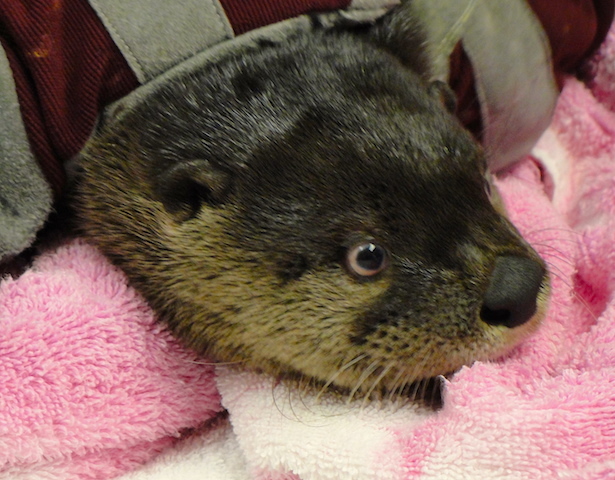 The four North American river otters still in our care were soft released ahead of the storm. All four otters have survived. The otters used a back stairwell of the hospital building for protection through the storm. The four otters were re-captured last week because they were unable to successfully find food during and after the storm. They will need further live prey training to hone their hunting and foraging skills before they are able to be re-released. 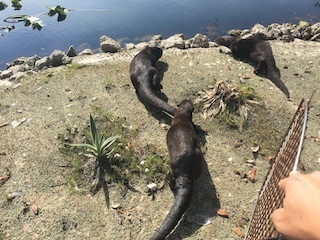 Three North American river otters were released this morning outside of Punta Gorda, Florida. Their release concludes nearly eight months of care at the clinic. Video of the release is coming soon on our YouTube channel. 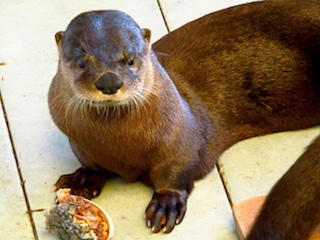 One otter remains at the clinic due to a small injury. Once it is resolved, it will be released in the same area as the three which were released today. The last of the young river otters was released today after making a full recovery from the foot injury that prevented it from being released with the others. 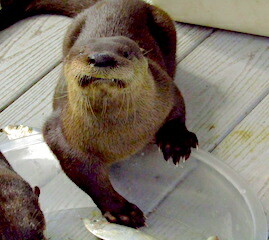 It was released in the same area the previous three otters were released last month.